Are you going to run an online store? You should be investigating the best platforms to set it up at the moment. If you are choosing between Shopify and WooCommerce, this article will help you take the right decision as it compiles the opinions of web professionals on the topic, strong and weak points of both systems as well as many other interesting points. If you are not tech-savvy enough to be familiar with most popular eCommerce platforms, you'd better opt for Shopify. We can say you this right from the start. Though, WooCommerce is considered more powerful than Shopify. It is more configurable and flexible. You need to be well-grounded with WordPress and cooperate with a web designer to get your WooCommerce store right. Before starting to consider whether you want to use WooCommerce or Shopify think well how good you are at web design. If you are not, think about whether you are ready to hire a web designer/developer to do the job you can't instead of you. Are you ready to do that? Well, then WordPress + WooCommerce is a possible way to go. If you are not ready to pay the outsourced workers and want to handle it all by yourself, you will have such possibility with user-friendly Shopify platform. It gives lots of room for growth. You can start out small with Shopify if you wish, then as your requirements and revenue grow, you could probably migrate to a fully-fledged WooCommerce site. Actually, both of these eCommerce solutions are awesome, but they are different. You can see their (as well as other engines) popularity on the wheel below. Would you like just upload products and sell them without all this fuss with searching for hosting and dealing with complicated configuration? Choose Shopify. Its functionality and customization options are vast if you take into account that Shopify is a hosted cart. Besides, Shopify is lightning fast. As we have already mentioned above, WooCommerce requires some effort at the start as hosting, security and performance are your responsibilities. But then WooCommerce provides you with WordPress grade SEO, which is better than Shopify's SEO. What's more WooCommerce is as flexible as WordPress. Both software admin panels are intuitive and simple. A lot of merchants love WordPress because of the freedom it gives in terms of design. You can also put in a code wherever you wish. You are able to communicate with your customers more effectively. You have full control over your hosting as well. Just like with WordPress your possibilities are endless with WooCommerce. 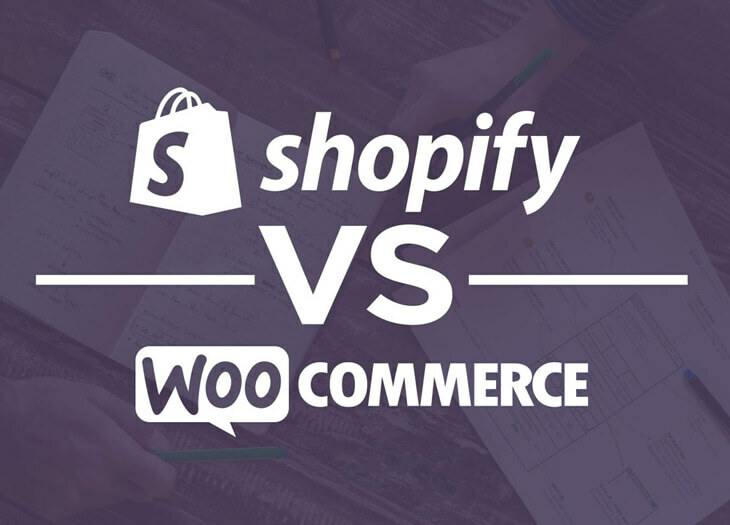 But let's briefly recap the differences between Shopify and WooCommerce. Shopify handles everything from the back-end, including hosting. Plans start from $29 a month. With WooCommerce you will need a web host and will need to install WordPress. Plans start from $3 a month. Shopify does not allow more than 15 administrator users even with the $299 plan. With WooCommerce you can create unlimited administrators, staff members, store managers or moderators. Shopify provides a report for the $79 per month plan and above. WooCommerce reports are built-in and free. Shopify is quite flexible itself, but not as much as WooCommerce. WooCommerce, being an open source platform, is more flexible. It offers complete access to your website files, source code and all sensitive data. Shopify has a much smaller database of themes costing $139 on average on TemplateMonster.com. There are much more WooCommerce themes available out there. Their prices range from $20 to $100 on average. You can view the variety of premium WooCommerce themes here. Shopify is more user-friendly as it offers a plug and play system for creating an eCommerce store. WooCommerce requires a time-consuming initial set up. Though once set up, it becomes as easy as Shopify. BTW, if you are going to buy a WooCommerce theme from one of the decent providers, like TemplateMonster.com, you can order your store customization and setup from their Service Center , which will free you from these headaches. Shopify offers 3 plans: basic - $29/month, normal - $79/month and advanced - $299/month. There is no fixed price with WooCommerce. The cost depends on your web hosting and theme. With Shopify, you will pay an extra $50 each month for features like professional reporting or gift cards. Commonly used plugins like Payment Gateway Integrations, Checkout Options, User Manager, etc. are available with WooCommerce for free. Shopify provides 24/7 support on all plans while in the case of WooCommerce you have to contact individual service providers. They may be your hosting service provider, theme developers or WordPress community. What about speed? You don't need to worry about uptime with a Shopify store. Servers have a good response time and sites load fast. As regards WooCommerce, speed depends on hosting. An expensive dedicated hosting can make sites run faster than Shopify. Are you overwhelmed with the above information? Please view the infographics created by SAG ipl. Such kind of visual presentation format lets to absorb big data amounts easier. Let's say it once again. Two solutions are different, that's why they are suited best for various company sizes and types. The shopping cart offers a fully hosted service. What does this mean? No pains for you and your staff with software maintaining updates installation, you also don't need to worry about servers. However, such ease has its price. The price is decent, but you should know that you are not getting a free solution. Even if you need to build a basic site with a simple cart, it will require you to pay a monthly subscription fee. But the benefits are worth the price: you can set up your checkout page in any of the 50+ languages, and you can always change the theme of your e-cart to suit the holiday periods like Christmas or Easter. But that's not all, you get automatic taxation services based on your location. It's a good bargain as Shopify will act on your behalf and calculate countrywide and state taxes for your shoppers, which is awesome. WordPress offers similar ease of use but much more flexibility. You can create and develop your own blog and turn it into an eCommerce business virtually for free. Do you remember that WooCommerce e-cart plugin lets you create your online store quickly at no extra cost at all? This e-cart software is used by thousands of small online merchants. It matches better for companies with a relatively low number of items on offer because indexation and cataloging on a large scale is an issue. With WooCommerce e-cart limitless capabilities customization of your cart to suit your niche buyers is a walk in the park. We guess that's pretty much of it and now you'll easily choose the right eCommerce solution for your business. We wish you best of luck and high conversion rates! Lana Miro falls in love with beautiful web-designs. She likes to share her experience and explore something interesting.